[GW2 Wintersday Fanzine 2017] Donation to MSF complete - Thanks for raising 2.1k! Current Status: Thank you for your interest & for those that have showed us so much support. We have shipped all ordered copies of the book, and we've submitted our donation to MSF on 1.23.2018 (here for proof). More images in this post. As many of you have hopefully heard, a few of the POW staff are putting together a Wintersday Fanzine, with all proceeds going to charity (MSF/Doctors Without Borders). We have 71 fantastic contributors (many of which you might know) to make a 100 page book filled with art and illustrated short stories. We'll be shipping in time for the end of the year, so we're fast approaching sales... and giveaways have already started! More information about the effort can be found on the really long FAQ. The final book is 100 pages in 4C (full color). It’s perfect bound, matte UV on the outside, glossy on the inside, and 7”x10” to match the original GW1 artbooks. There are 71 contributors in the book - both short stories and illustrations will be featured - there are previews on both Tumblr and Twitter. The current contributor list can be found here. Since it’s asked a lot, POW is a gaming community that was formed in 2013 through GW2! We do annual mailed cards and other events, such as postcard screenshot contests, larger precursor raffles and gem giveaways. We’ve also held in-game events and other physical sender items, such as birthday cards and other random things as time and inspiration allows! Info dump is here on the mods and community. If you’re interested in purchasing one, it’ll be going live on November 1st. You can get on the notification list here with your email. Preorders have ended! Thank you! The Zine Giveaway will start on Nov. 1 with the pre-order post. We've donated three (3) zine books to Pink Day in LA, so be sure to donate to their good cause! We have three zines that will be raffled off by community members: more info soon. Giveaways have also ended! Thank you. Zorav -- @ZoravPOW -- Twitter at WintersdayZine & Tumblr at the same. ArenaNet Creative Partner. Organizer of the the GW2 Artist Collective, creating Tyrian Tarot and the annual Wintersday Zine. The postcard giveaway has a week left, and preorders start on the 1st! We're all very excited. Hey all! Preorders for the book have begun!! We are so excited to see the Wintersday Zine. Can't wait! Thanks Gaile! We're in the final steps of layout, and we're so excited that everyone can see it soon!! What started as a pet project has definitely turned into something gorgeous. I will try to share this info on CSL later this month. I think it's a great initiative and hope that others will support this project. I saw your email - very excited for that! The contributors were excited to hear that as well. Thanks for your support! Loving this! Ordered the whole package right away! Thank you for your support!! We've very excited for everyone to get these. 2 days left in the preorder period! Many apologies for responding to this eons late, but I'm glad you snagged one, and I hope it's arrived (or arriving, if you're international) soon. Thank you for supporting us, and we hope to see you again in the future. Updated this post because woo, there's an edit system now. Thank you to all for your support. dang....just saw this today. would have loved to buy it. 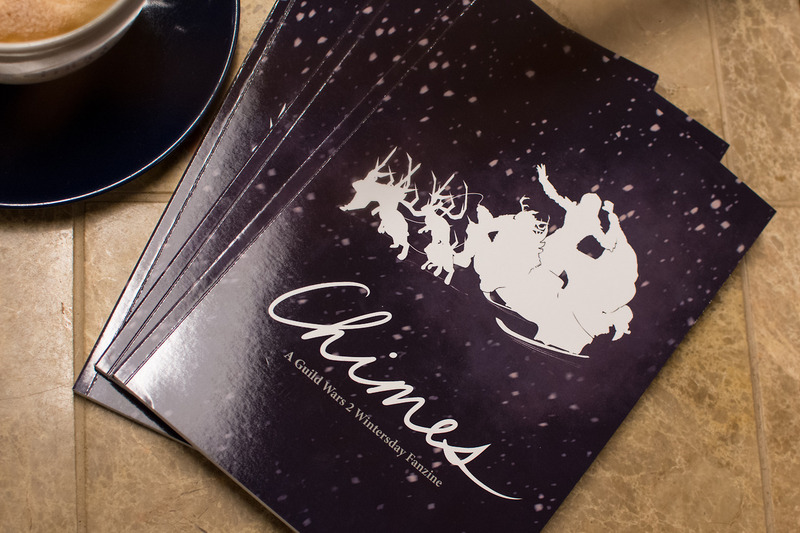 @NaviNation.2680 -- As you know, POW kindly sent us a copy of Chimes, and I was positively blown away by its excellence. You all just do amazing work, from the artist to the writers to the people doing layout and publication. I'm a fan for life, I tell ya! In response to several questions I've received, I wanted to ask you if there are any remaining copies available. I know the preorder is long past, and the dispersal of copies is done and dusted. I just wanted to check to see if there are copies left of any kind. Edit to add: I note you updated your initial post to say that someone could order an extra copy by the 15th -- is that January 15th? Many thanks to all concerned! @Gaile Gray.6029 - Apologies again for just seeing this. If there's an email notification for this forum, I definitely should put it on. We released "scuffed" copies (basically they were light impressions on the back and the spine on some, nothing that impaired any reading) earlier this month. We have a few that we'll be releasing with WDZ 2018 (edit: the extra one we had available is now gone!). As for next projects, I'll drop a post up shortly for the GW2 Artist Collective, which is our next project featuring Tarot Cards. Got an excellent group (with many returning artists, and quite a few new ones). Excited for it, and I'm very glad you're a fan. @arenta.2953 - If you have any interest in the scuffed version I mentioned above, you're free to email me. (I'm apparently really awful at reading this forum regularly, but read my email 24/7). We released "scuffed" copies (basically they were light impressions on the back and the spine on some, nothing that impaired any reading) earlier this month. We have a few that we'll be releasing with WDZ 2018, but do have one slightly scuffed version that still can go out this month (if anyone wants it, it's available at [email protected] - I'll edit this out when it gets taken). Ok, so if I read this properly, the Winterzine is totally and completely sold out, but you should check the new thread for information on their next project: Guild Wars 2 Tarot Cards! As a fan, as a player, I can't tell you how excited I am about it!